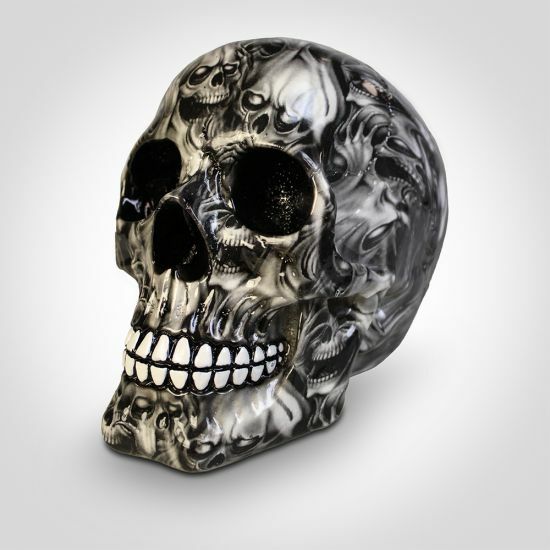 The Soul Skull is a detailed resin figurine of a skull with one important difference; it features an incredibly detailed overprint showing ghostly skulls and figures twisting and writhing in what appears to be eternal torment. The skull itself has its main features (eye sockets, nose and teeth) highlighted in black and white so that from a distance it looks almost like a normal skull. The perfect way to bring a touch of the macabre to your home of office, the Soul Skull works equally well as an ornament to take pride of place on your shelf or as a more practical paperweight on your desk.